3 bedrooms and 3 bathrooms, double wooden terrace with shade sails and garden furniture! This tailored cottage offers unrivaled comfort to big family or friends. Everything has been designed so that you can experience comfort and conviviality atmosphere. 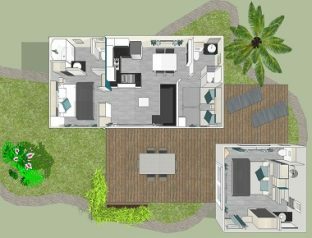 This new concept provides a cottage of 39m ² with 2 bedrooms with private bathrooms and fully equipped living space + an independent suite of 16m ² for 2 people. This “Suite” is flexible according to your needs (2 twin beds), it is air-conditioned and has a bathroom with shower and separate toilet. With direct access to the terrace, everyone will enjoy the quietness of Premium area, a privileged and wooded area where life is good! Excellence has a price, from 125 € per night for 6 people. Offer you the best for your next holidays! When you book a cottage from our Premium Range, you are guaranteed a luxury accommodation, offering quality services and amenities. It’s the art of combining luxury with nature to live an unforgettable holiday experience!